MS Subbulakshmi also played the male role of Narada in “Savitri” (1941) to raise money for launching Kalki, her husband’s nationalist Tamil weekly. Her title role of the Rajasthani saint-poetess Meera in the eponymous 1945 film gave her national prominence. This movie was re-made in Hindi in 1947. Pandit Jawaharlal Nehru had this to say about M.S. 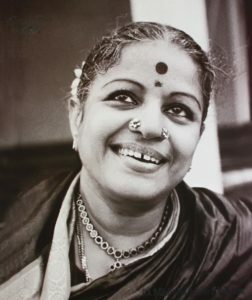 Subbulakshmi- “Who am I, a mere Prime Minister before a Queen, a Queen of Music”. While Lata Mangeshkar called her Tapaswini (the Renunciate), Ustad Bade Ghulam Ali Khan termed her Suswaralakshmi (the goddess of the perfect note), and Kishori Amonkar labelled her the ultimate eighth note or Aathuvaan Sur, which is above the seven notes basic to all music. The great national leader and poet Sarojini Naidu called her “Nightingale of India”. Her many famous renditions of bhajans include the chanting of Bhaja Govindam, Vishnu sahasranama (1000 names of Vishnu), Hari Tuma Haro and the Venkateswara Suprabhatam (musical hymns to awaken Lord Balaji early in the morning). She was honoured as a resident artist of Tirumala Tirupati Devasthanams. Tirupati Urban Development Authority (TUDA) has installed a bronze statue of M.S. Subbulakshmi at the Poornakumbham circle in the temple town. It was unveiled by Andhra Pradesh Chief Minister Y. S. Rajasekhara Reddy on 28 May 2006.